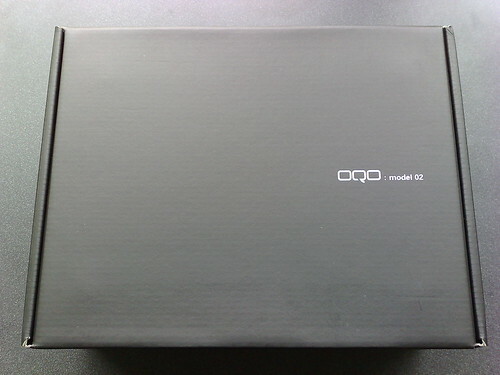 The OQO Model 02 has landed… It has been anticipated for months, but it’s here, in my dirty little hands! The photo of the 02 with the dollar bill was my fave. I need more like this: new stuff next to recognizable stuff. Could you also do one with a vodka bottle? And a TENS unit? It is a goodlooking unit, let use know if it can do Google Maps/GoogleEarth without stress. Does your personal model look fresh or is it all beat up? As you can see in my pictures, my OQO Model 02 is in mint condition. When did you place your order? I’ve been waiting for months! January 8, 2007 just after midnight. Would be great to see a direct sunlight photo to see if the outdoor/indoor screen is up to the job. Would love to see a full review after some use. We’ve been limited to preview reviews and show reviews but would love to know your thoughts on it as a user. To follow up on Raffij’s request, even a comment about daylight viewability would be welcome. I was really disappointed by the Nokia N800’s poor viewability in direct sunlight. I’m afraid that, if I were to use it with a GPS, I might well be stuck in situations where I can’t control the amount of sunlight. If the 02 were claimed to be equal to to the 01+ in direct sunlight, that would bode very well. As it is, I can’t find any reviews mentioning sunlight and, when I got to play with an 02, it was on a completely overcast day. And screen wobble as I experienced? Picked mine up from RCS in New York on Wednesday. I had to get a leather case made for the Sony UMPC because they had none for the OQO yet. Of course, the day after I get an email from OQO that my order has shipped, so now that one is being sent back. Best XP Pro Sprint ordered on March 21st, by the way. Avoid Verizon and Vista if you want a more responsive 02, if you want it in your hands faster, and if you want real “unlimited” EVDO service (so I’ve heard for this last point). I’ve read that the 02 with Vista takes a minute or so to boot, mine with XP Pro takes less than 30 seconds. The Sprint EVDO works perfectly around Manhattan, I need to test it on my morning train to White Plains though. I’ve been searching for a solution like this since the mid-1990s, a small machine with broadband wireless. My first attempt was a 3000 series iPaq with the PC Card sleeve and a Metricom card. They went out of business a few months after I started using it. Almost 10 years later, I think someone got it right. The Model 02 is responsive, not sluggish in the least, feels very solid – IBM laptop solid – and is very comfortable to use and type on. I can’t decide which I like more, the track stick/mouse buttons (and I normally hate track sticks) or the digital pen. The keyboard is as good as it gets when it comes to thumb boards. The only negative to report is the DVD writer on the docking station. Specifically, I tried installing some software with the DVD writer, and it was sssslllloooowwww. I assume this is a driver issue, as it was reading at like 4x or something. I even installed World of Warcraft on the thing and got it to run. I has to use windowed mode to make the pointer work properly, but it worked, even though it was choppy at the lowest graphics settings. Worked for AH browing and chatting if you increased the font size.